In any business, it's extremely important to be able to prioritize what you work on and when you work on it. This is especially the case for product managers. But how do you prioritize all of the great ideas that come across your desk? I'm fortunate enough that the company I work for isn't short of great ideas - we're short of the resources to implement all of those great ideas. Part of being a good product manager is learning when to say 'no', and because of limited resources I find myself saying 'no' more than I say 'yes'. But saying 'no' is half the battle - it's trying to figure out what to say 'no' to. is this important to do? does it align with the product vision? how long will it take us, and can we spend that much time on it? what do we need to build it? But a product manager can answer all of those questions, and if the customer doesn't want it them it's not worth any of the effort that was put into it. Staying focused on the customer experience and being the voice of the customer through the development process will help a product manager make decisions about what to do and when it should be done. Another method that has come in handy for me, and aligns with the questioning exercise above. I will do an 'impact / effort' analysis for larger initiatives. I rely on my development teams to provide a high level estimate for the effort required, and I work with the business owner to understand what the business impact would be. Figure out what the user needs and technical considerations are, and who will be involved and how long it will take them, and then you can prioritize based on that analysis. Both of these strategies have helped me in the past - but they're not fool proof. 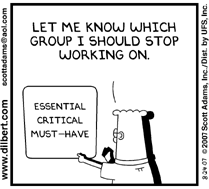 I'm planning to align this with my next post on roadmap and prioritization. What do you do to prioritize? What are some of the strategies that you use? Is there an easy way to say 'no' to a project? How much data do you need to make a valid decision? Great post.Thank you so much for sharing this post.